Valvar pulmonary stenosis. The valve leaflets are thickened and/or narrowed. Supravalvar pulmonary stenosis. The pulmonary artery just above the pulmonary valve is narrowed. Subvalvar (infundibular) pulmonary stenosis. The muscle under the valve area is thickened, narrowing the outflow tract from the right ventricle. Branch peripheral pulmonic stenosis. The right or left pulmonary artery is narrowed, or both may be narrowed. 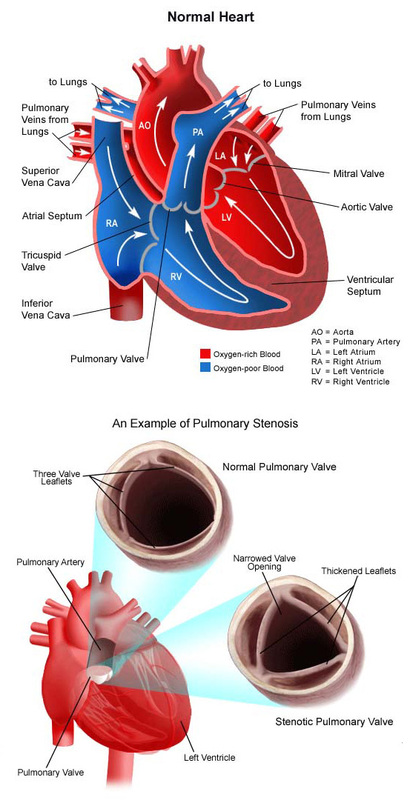 Pulmonary stenosis accounts for 5 to 10 percent of all congenital heart defect cases. Mild pulmonary stenosis may not cause any symptoms. Problems can occur when pulmonary stenosis is moderate to severe. When this is the case, the right ventricle has to work harder to try to move blood through the tight pulmonary valve. Eventually, the right ventricle is no longer able to handle the extra workload, and it fails to pump forward efficiently. Pressure builds up in the right atrium, and then in the veins bringing blood back to the right side of the heart. Fluid retention and swelling may occur. Swelling in the feet, ankles, face, eyelids and/or abdomen. The symptoms of pulmonary stenosis may resemble other medical conditions or heart problems. The pediatric cardiologists at CHOC Children’s can carefully diagnose a suspected heart condition and provide a comprehensive treatment plan. If a child’s doctor hears a heart murmur during a physical examination, the child will be referred to a pediatric cardiologist for a diagnosis. In this case, a heart murmur is simply a noise caused by the turbulence of blood flowing through the narrowed pulmonary valve. Symptoms your child exhibits will also help with the diagnosis. Chest X-ray. A diagnostic test that uses X-ray beams to produce images of internal tissues, bones, and organs onto film. Learn more about X-rays. Electrocardiogram (ECG or EKG). A test that records the electrical activity of the heart, shows abnormal rhythms (arrhythmias), and detects heart muscle stress. Learn more about electrocardiogram. Some infants will be very sick, require care in the cardiovascular intensive care unit (CVICU) or neonatal intensive care unit (NICU) prior to the procedure, and could possibly even need repair of the pulmonary valve if the stenosis is severe. Others, who are exhibiting few symptoms, will have the repair scheduled on a less urgent basis. Balloon dilation or valvuloplasty. An interventional cardiac catheterization procedure is the most common treatment choice. A small, flexible tube (catheter) is inserted into a blood vessel in the groin, and guided to the inside of the heart. The tube has a deflated balloon in the tip. When the tube is placed in the narrowed valve, the balloon is inflated to stretch the area open. This procedure may be used for valvar pulmonary stenosis or branch types of pulmonary stenosis. Children who have undergone balloon dilation may need to follow antibiotic prophylaxis for a specific period of time after discharge from the hospital. Learn more about interventional cardiac catheterization. Valvectomy (with or without transannular patch). Valvectomy is the surgical removal of the valve and is frequently accompanied by the placement of an outflow patch to improve blood flow from the right ventricle into the pulmonary artery. Once the individual reaches adulthood, the pulmonary valve may need to be replaced. Patch enlargement. Patches are used to enlarge the narrowed areas. In subvalvar pulmonary stenosis, an incision is made into the right ventricle, muscle causing the obstruction below the pulmonary valve is divided, and a patch is sewn into the cut edges of the right ventricle to enlarge the area below the pulmonary valve where the narrowing used to be. In supravalvar pulmonary stenosis, the narrowing is in the artery just beyond the pulmonary valve. Patches are sewn into this artery to enlarge its diameter and relieve the narrowing. Pulmonary valve replacement. Replacement of the pulmonary valve is a surgical procedure that is often recommended in adulthood in the case of leaky pulmonary valves. A tissue valve (pig or human) may be used. Children who have undergone a valve replacement will need to follow antibiotic prophylaxis throughout their life. What is the long-term outlook after pulmonary stenosis repair? Your child’s cardiologist may recommend that antibiotics be given to prevent bacterial endocarditis for a period of time following surgery and always for all valve replacements. Occasionally, repeat interventional cath lab procedures may be necessary during infancy and childhood to stretch the valve open. Replacement of the pulmonary valve may be recommended later during adolescence or early adulthood to prevent complications such as enlargement of the right ventricle, heart failure, and arrhythmias (irregular or fast heartbeats). Interventional procedures take place in our state-of-the-art cardiac catheterization laboratories. When the procedure is complete, the catheter(s) will be withdrawn and a small dressing applied. If blood vessels in the leg were used, your child will be told to keep the leg straight for a few hours after the procedure to minimize the chance of bleeding at the catheterization site. Your child will be taken to a unit in the hospital where he or she will be monitored by nursing staff for several hours after the test. The length of time it takes for your child to wake up after the procedure will depend on the type of medicine given to your child for relaxation prior to the test, and also on your child’s reaction to the medication. After the procedure, your child’s nurse will monitor the pulses and skin temperature in the leg or arm that was used for the procedure. Your child may be able to go home after recovery and observation for a specified period of time, providing he or she does not need further treatment or monitoring. Infants and children under one year of age will be kept for approximately 24 hours for recovery and observation. You will receive written instructions regarding care of the catheterization site, bathing, activity restrictions and any new medications your child may need to take at home. Urinary catheter. A small, flexible tube that allows urine to drain out of the bladder and accurately measures how much urine the body makes, which helps determine how well the heart is functioning. After surgery, the heart may be a little weaker than it was before, and the body may start to hold onto fluid, causing swelling and puffiness. Diuretics may be given to help the kidneys remove excess fluid from the body. Your child may need other equipment not mentioned here to provide support while in the CVICU, or afterwards. The hospital staff will explain all of the necessary equipment to you. Your child will be kept as comfortable as possible with several different medications; some of which relieve pain, and some of which relieve anxiety. The staff will also be asking for your input as to how best to soothe and comfort your child. You will be taught how to care for your child at home before your child is discharged. Your child may need to take medications for a while, and these will be explained to you. The staff will give you instructions regarding medications, activity limitations, and follow-up appointments before your child is discharged.